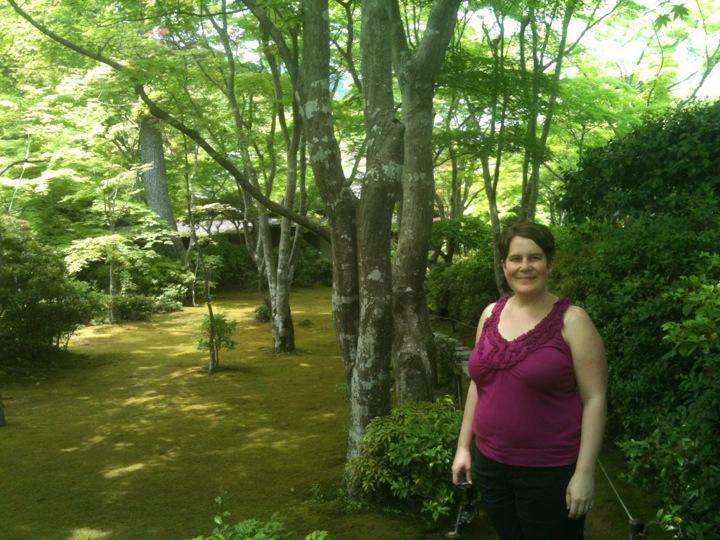 We celebrated our sixth anniversary in a lovely hot spring town called Kinosaki. We were warmly welcomed to our Ryokan by a little Japanese man called Mr. Tamura. He spoke English well and made funny jokes, and always began his questions with "Mr. Christopher...". Our tatami mat room had a lovely tea table where we were offered tea and cookies shaped like crabs (they are famous for crab which Chris later enjoyed for dinner.) Mr. Tamura dressed us in our Yukata and gave us a pass to go to seven different onsens in town. We wore wooden sandals for this adventure and began our relaxing evening in the hot baths. Kinosaki is a cute little town about a mile long with a stream thru the middle of it. There are little stone bridges that you can cross over. Each Onsen had a different feature like an outdoor rock bath, a cave Or a waterfall. We had a dinner in between and couldn't wait to get back in the baths. Many of these little places have outdoor foot baths that you sit and soak together at. As darkness crept in the tourists disappeared and we felt like the only tourists there. Every bath we entered had only a few locals. We made it to five of the seven, and one the following morning. Our good nights sleep on futons was followed by a great solar annular eclipse in the morning which we enjoyed on the way to our morning bath. A 10 dish Japanese breakfast was served in our room and we enjoyed trying new foods. Well, Chris did....you know me....I grinned and bared it. This was a great little town to stay in for a memorable anniversary. Our sixth year together has gotten off to a great start. Now it's off to Hiroshima. Barb So enjoying your updates. Sounds like a fabulous anniversary. Saw Rick Hansen in White Rock on Saturday evening. Hiroshima will be a moving experience.